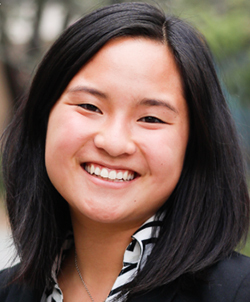 The Berkeley Political Review, or BPR, announced Tuesday that it has terminated ASUC Senator Isabella Chow’s membership after anti-LGBTQ+ statements Chow made at a senate meeting Oct. 31. 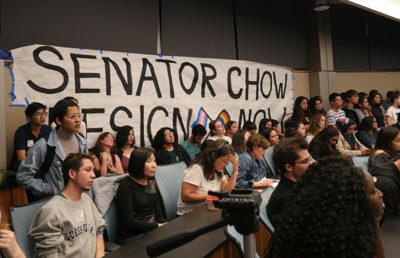 Chow stated at the meeting that she could not support a resolution against the Trump administration’s proposed Title IX changes because God created man and woman, marriage should be between a man and woman and certain lifestyles conflict with what is “good, right and true.” According to an editorial published by BPR, Chow’s statements do not uphold the values of the organization. “Senator Isabella Chow made remarks that directly violate and threaten our organizational duty to ensure that our members feel secure in our publication and that their contributions are validated and protected in our space,” the editorial states. BPR editor in chief Nicolas Friedlich said in an email that the organization will not provide further comment on Chow’s disaffiliation. Chow served as the business and marketing manager within BPR. Because of the nature of her position, BPR consulted with several “institutional channels” and conducted an internal review process to determine a course of action. 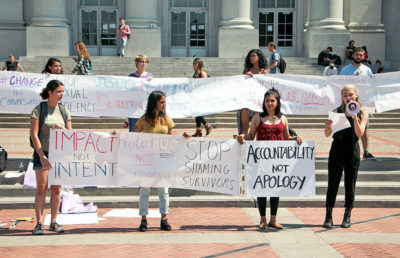 Chow was permitted to provide testimony on her behalf, and after all aspects of the review were considered, BPR’s internal body concluded that Chow’s membership should be terminated, according to the editorial. “While BPR strongly affirms non-partisanship, any view that denies the validity of a community does not fall within the spectrum of political discourse that our guiding mission allows for,” the editorial states.